The second installment of Doodle Army has evolved quite a bit from its predecessor. Instead of just being side scrolling shooter type game, you have complete freedom of movement in two axises thanks to a handy limited-used rechargeable rocket boots. The buttons of the original have been replacement by a pair of virtual joysticks, one that handles your movement in any direction while another handles your shooting. Doodle Army 2 is the product of massive amounts of feedback from players, and the coolest new feature in my book is the implementation of total online multiplayer via Game Center. Sure it’s only four players, but the maps seem to be designed so that you’re never really ever hunting for someone to shoot for too long. 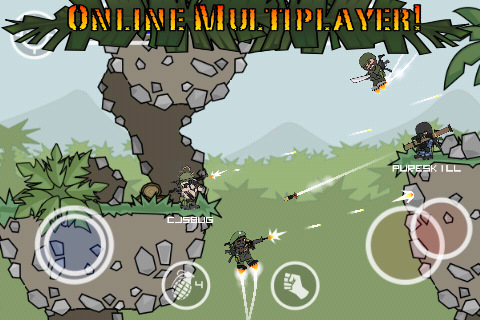 Doodle Army 2 is free to download, with a single 99¢ in-app purchase unlock which grants access to the full array of weaponry in online play, the ability to customize your avatar, and the removal of the included iAds. As I’ve mentioned with games in the past, I really dig this style of IAP as it gives you the option of either playing the game forever in a (somewhat) limited scope with ads, or you can throw out a buck to unleash the beast. Now that there’s a multiplayer component, it’s probably best to get in early to hone your skills as I have no doubts that Doodle Army 2 will shoot up the charts just like the original… Resulting in a fresh crop of newbies online to slay on a daily basis.